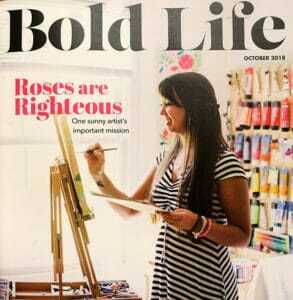 Bold Life Magazine featured two Brevard College Alumni artists. Bethany Joy Adams and Bianca Mitchell graduated in 2014 and 2003, respectively. These two Brevard College alumni, along with many others, use their degrees in their everyday and professional lives. Adams earned a Bachelor of Arts Degree in K-12 Art Teacher Licensure, and Mitchell earned her Bachelor of the Arts in Art. Karin Strickland a Brevard local and Brevard College Wilderness Leadership and Experiential Education graduate, photographed these two alum as the Bold Life photographer. Adams accepted her dream job with the Boys and Girls Club of Henderson County as the Art Director, after spending four years in the Brevard College education department. Mitchell applies her expertise in logistics and organizational management at the Lake Toxaway Real Estate Company, where she serves as the Director of Real Estate. Visitors to Lake Toxaway Real Estate Company enjoy many of Mitchell’s mixed media art displayed in the company’s main office. Mitchell also serves on several committees at Brevard College. Mitchell’s, “Seeking Home” is an exhibition featuring a series of maps that explore the storied region. She expresses her deepest reverence and connections to the land through these maps, “We studied in real estate how there was a period of time when land ownership was about working the land. If you were using it and its resources, it was yours,” Mitchell said. Mitchell participates in various art exhibitions, including exhibits at Brevard College. She is a member of the Lake Toxaway Art Guild, the Transylvania Community Arts Council, and a former steering committee member for Brevard College’s Friends of the Fine Arts. Bethany Joy Adams, Bianca Mitchell, and Karin Strickland are excellent examples of who you can become with a Brevard College education. Brevard College strives to graduate students who will earn a career using their degrees.